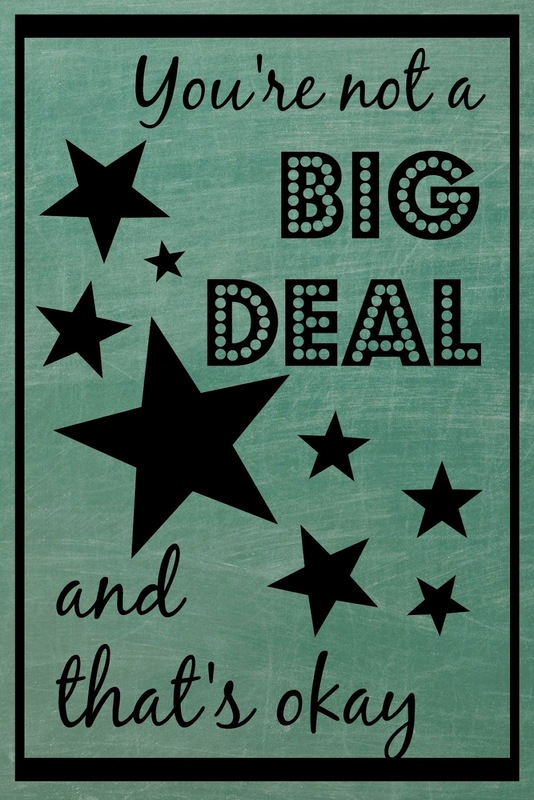 You're not a big deal and that's okay. I'm not either, so we're in this together. I know there's blog posts and Pinterest pins and podcasts and magazines that are telling you that you can be GREAT. I know that a lot of our American culture, especially as it is lived out via social media feeds, sets us up to believe that if we just do these Five Quick Tips we will be awesome. We will have arrived. That's just not the way it works. I'm going to speak very specifically about the world of blogging because that's where I see it play out so vividly and also because it's something I want to tell every client I've worked with in my blog consulting business. I'm 99.9% sure that you're never going to be a BIG Blogger. You're not going to make a full time salary from blogging. You won't be giving away KitchenAid stand mixers while you work hand-in-hand with major corporations. You won't get your own show. You're not going to be a big deal. And I promise, promise, promise you that that's okay. A mistake many bloggers make is to live in hopes of the 'k'. I know because I've done it too. What's the 'k'? It's when you have so many likes or followers or fans that IG or FB or Feedly uses the letter 'k' instead of all the zeroes that mark one thousand. 999 likes + 1 = 1k. Or 27k followers or 350k hits a month. Don't live for the 'k' and definitely don't write for it. If you do, you will grow to resent successful bloggers (who are really only successful because of luck - sure talent and effort too! but mostly luck). If you do, you won't be happy with the two comments you did get out of the pool of fifty people who did read your post. If you do, you will feel blogging burn out and you will feel like a failure. It doesn't matter if you are thinking of starting a blog, if you've been blogging for two years, or if you've been blogging for 10 years - the only reason you should blog is because you enjoy it. All of this is not to say that it's bad to want to grow your readership! Not at all! The best part of blogging is the community that comes from it and your readers are your potential friends. If you're blogging for the community - we can tell. If you're blogging because you want to be famous, make money, go viral, etc - we can tell. Speaking for myself, the best blogs (usually not this-once-was-a-blog-but-now-it's-a-website-making-me-money) feel like a living room. I come to your site and there's a bright, cheery picture of you smiling and welcoming me to your space. It's decorated like your living room - reflecting your style, faith, family, loves, and interests. We sit and chat about movies, kids, books, politics, faith, celebrations, school, losing weight, sleep, recipes. Some of the conversation is light - almost fluff - and some of it is really personal, beautiful, trusting, and sincere. Most of those blogs don't have the 'k'. Most of those bloggers are not a big deal. Most of those bloggers have 25, 67, 120 followers and really, truly that is fabulous. And what about the ones who do have the 'k'? That Big Blogger who has made it. We think of her as a Big Deal. But her neighbor across the street just thinks of her as a mom who takes lots of pictures of all her kids and gets lots of packages. Really, even she is not a Big Deal. She's a person who started something, kept doing it because she loved it, invested her talents and effort into it, and then just. got. lucky. If you're blogging to be a big deal maybe you should take a step back. If you're feeling burned out for other reasons maybe you should take a step back. If you find yourself feeling jealous more than feeling happy for other bloggers' successes maybe you should take a step back. But keep your blog. Keep it hanging out in the internet so that when you are ready to write or share again it's there and so are your followers. Keep it so that when you comment on other blogs there's a site linked to your name so people can still get to know you. Keep it so that when you're ready to enjoy blogging and you're ready to not worry about stats and likes and being a Big Deal - it will be ready for you. And so will we. If you're new here, stick around! You can follow A Knotted Life on Bloglovin' or Feedly. Plus, I'd love to connect with you. You can find me on Instagram, Pinterest, and Facebook. I hope to "meet" you soon! I don't blog, but this post inspires me to be original, honest and sincere in every aspect of my life. I think the more blogger goes viral, (often) (s)he looses much of these virtues. For me, the worse are blogs who turn into constant giweaways and sponsored posts once they make it to the k list.I lose my interest right away. Love this, Bonnie! I've started--and then quit--blogging in the past, because I fell into the trap you describe. I just started a new blog that probably won't interest as many people, but feels more authentic and important to me. Great post! Recently I've been blogging more about how I'm decorating my home and celebrating feast days and birthdays and holidays. I don't know if many people really care about those things but that's what I like doing and it's fun for me to craft those posts - so that's what I'm doing. So all that to say, I know exactly what you mean. Bonnie, that's exactly the kind of thing I love to read here! Thank you! I started blogging because I followed one mom blog that I loved to read and because I lived far away from my family and I wanted to tell them stories about my new little person. I had NO BLOGGING ASPIRATIONS. So I tootled along and posted when I had the time and never cared if I had "real content"; it was always fun to get new readers, and comments were the cat's meow, but I did pretty much zero to intentionally grow the blog. Then I stopped working part time and decided to grow the blog more intentionally. I started to stress about content, I cared about my numbers, I started to reach out to companies for giveaways, stuff like that. And it kinda worked. I mean I've seen my numbers grow a little (a very little) which has been cool and fun in it's own way, but it hasn't been truly fulfilling. If anything it's been the opposite. It's fulfilling to catch my husband reading the blog on the sly, it's fulfilling when my mom's friend e-mails me a recipe because she reads my "website" and thinks I'd love these chia seed cookies, it's fulfilling to read my own archives. No joke. Rereading my stuff is one of my favorite things to do. I'm trying to get back in touch with my old bloggy self. I've missed her. She wrote great posts and stressed about them not at all. She also read more blogs: she read blogs that she loved, not blogs she was supposed to. She commented because she had something to say and not to drive traffic to her own space. I'm sure I'll keep doing things to grow the blog, mostly because I understand the game better, but I want to play for the love of it. This is so sweet Kate. I love you on your blog AND in person! I like this quote, I want to play for the love of it. I enjoy blogging as a creative outlet, and I also realize I have good news to share with others so I'm going to--and to do that I put work into growing my blog. I struggled for many years and felt all alone in my struggle; I do not want that for other women. I want to be a voice that says, "Been there, let me offer you some encouragement to keep going, keep fighting because you are so worth it." I think we can desire to grow and still remain a comfy couch chatting kind of girl. I agree with Kendra! You put it perfectly Kate. "It's fulfilling to catch my husband reading my blog on the sly". Yes :) that's my favorite. I think it's legit to want to grow your readership and I think that if you do it in a fun way - thinking of it like making new friends and not just getting new followers - well, I think it can be really rewarding. I like this post a lot! My little blog is waiting for me to be inspired, and it's nice to know it's there when I am good and ready. It's so funny you write this, because I was just thinking about this topic this morning. I am so glad to be a little unknown blog. I actually feel sad for the bloggers who get all famous and write books and such because then they stop blogging and I miss them, the real them. You know? I like the keep it realness of the little blogs. I actually feel sorta sad for big bloggers too. I mean one of the joys of being small and unknown is that really for the most part, I don't get negative comments. And, I really hate negative comments. I'd rather be small and unknown and more "anonymous" than feel like my entire life in on display and up for criticism. Yes, I feel bad for big bloggers and all the hate that comes their way, too. I love this post! This really is what blogging is all about. I think we all wonder sometimes why this or that person has more followers or is more popular than us, but this is a great reminder that it's not all about that. Love it! I just resurrected my blog with the intention of writing for ME about things that am passionate about and love to share. Thanks for the encouragement! I love this! Such a god reminder about the motivation to blog! Great post. I blogged and then stepped away because I realized I was doing it for the wrong reasons. During that break I realized and was told by my husband and spiritual father that blogging serves a necessary good for me. It's a creative outlet, an project to keep my mind active and occupied. Great. Just great. I took some time to step back and ask myself, "What do I have to offer?" and "Why am I doing this, anyway?" and realized that I like to encourage, I like to learn, and I just love *people. * And then I went from there. It's been interesting to see my tiny corner of the internet get a little more attention once I realized that numbers don't really matter! Thank you so much for sharing this! It is exactly what I needed to hear right now. And pretty much echoes the words my husband said to me just yesterday when I said I wanted to stop blogging. Thank you!!! I don't want to be a big blogger. The pressure and the work would be the death of my fun. I enjoy writing, and I am glad that family and friends like to read it (although I get wigged out when they try to talk about it in person. My blog is like my secret life that shall not be named. ), and I love that I have met some wonderful friends through blogs. Yet I've even fallen into the numbers trap on occasion. It's hard not to sometimes. Thanks for the reminder! Christine, I laughed at your "my secret life that shall not be named" comment. I understand you and feel the same way! 100%! This is really excellent Bonnie. I also think that, especially in Catholic and parenting blogs, you never know when ONE post of yours is going to make a huge difference for ONE person. That won't show up in stats, but it's very motivational for me. That is a very important and very true point, Kendra. Thanks for sharing it. Thank you so much for writing this! I just started my first blog this past month and this is a great message for me to always hold on to why I started it in the first place! And by the way, I love your blog!! Wonderful post! I am at peace with my micro-blog! My husband and I enjoyed hearing you speak last night and my children listened to our re-telling of your story with amazement. This is beautiful, Bonnie. Thank you for it. Great post Bonnie! Also, it was such a pleasure to hear you talk on Saturday and your chocolate chip cookies were AMAZING! Have you posted the recipe on your blog? My husband was grateful you sent some home for him as well. :) I hope you have non-eventful travels back home. I'm so glad we met! Thank you for this excellent post. This is the very thing I have been mulling over off and on for over a year. I even took a step back and quit blogging for several months. I then popped back in and find that I have nothing "exciting" to blog about. Every day life is work enough, happy enough, tough enough, busy enough, than for me to try and rewrite about it. That just takes more time. I'm not sure what readers want any more nor does it matter. I clearly don't have the brain power or time to write those thoughtful posts I once did. When it bothers me and I feel 'small', I remind myself that it isn't really for them. It's for me, it's my memory bank, it's my heart out on the internet. For that handful of faithful friends who still read from me, it's enough. I just need to remember that and why I started blogging. I've made wonderful friends I can't imagine life without, even if they are far away. So yes, I leave my blog up and running with hopes that each time I do return it leaves me satisfied and feeling creative. The numbers really don't matter. Thanks for this! I came upon this community by googling "Catholic Mom Blog" when I was feeling lonely one day while home with my first baby. I had never really read any blogs and I couldn't believe that there were people out there who actually thought like I did. I didn't understand the blog levels. I was pretty naive about it. The first blogger I emailed to ask personal faith advice from was Jennifer Fulwiler and she actually emailed me back. I had no idea what a big deal she was lol. ( I still read that email she sent me from time to time) Anyways, when I figured it out how many different blogs there were I was still hesitant to start my own because it was so intimidating to me. Eventually I did. The reason for community and maybe to make friends. It's nice to write and formulate my thoughts in a organized fashion. I think this is a great thing to remember in general, too! I don't have to be a best-selling author, a movie star, a winner on American Idol, or a renowned physician to be worthy of dignity and respect. I can (try) to work quietly and humbly for God. So, I told myself something like what you've written here when I started blogging. Though I can't lie- I think it would be really satisfying to be a published writer. Mostly, it's just fun to tinker with my blog. I do it when I compelled to write, like now as I prepare for Advent and Christmas!! It's been helping me think through things. And I am trying to get used to reaching out to people via the Internet. :) That takes getting used to. :) Great post!! "But keep your blog". Yes. Thank you so much Bonnie, for your sweetness and your perfect way of wording some o dat truth. Thank you Bonnie! this is a very timely post because I have really been thinking a lot about starting a personal blog lately, for several different reasons. have to admit the thought "maybe I could even make some money" has been part of it....on that note I would probably be pleased with $5 a month....but still I think you're right in that money probably should not be a part of my discernment process. I am leaning towards doing it to help me stick to my commitment to practice writing and for the freedom to write about whatever I want...as opposed to my blog apostolate which has a very narrow purpose. And hey I would love a tried and tru great chocolate chip cookie recipe if you are passing them out! Emily, I'd love to share it but I don't want to just post it since it's America's Test Kitchen. I just love this, Bonnie. Thank you! Yes, I need to hear this all the time, I need it pounded into my arrogant, vain, self-glory seeking head. I just found this post now as I am working on developing my blog and working out my goals. Thank you so much for this reminder... something tells me I'll be referring back to this whenever I start to get off track. Great post!